It is Easter time, the season of chocolate, and where better to get your chocolate fix than the place synonymous with this decadent delicacy, but also a place of culture, beautiful scenery and yodelling – a place called Switzerland. Famed for much more than detailed Swiss master chocolatier creations, Switzerland is a fascinating country tucked away in the Alps with a lot to offer travellers all year round. 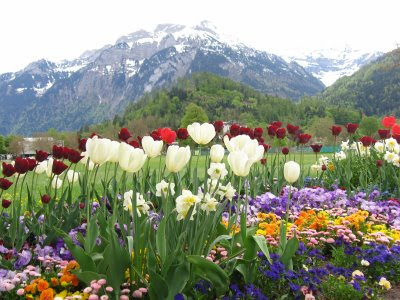 The Swiss have always maintained and nurtured their own local customs, and because of this, Switzerland is a country with an enormous wealth of cultural activity and living tradition. The Swiss are a polite and reserved people, and do not take kindly to rowdiness; a great tip if you want to have a good experience in Switzerland. There are four main languages, the most widespread being German, then French, Italian and Romanch, although basic English is spoken and understood, but mostly in the tourist hubs. Switzerland is a country that runs like clockwork. Getting around is effortless and travellers can choose whether to hire a car, walk, hike or take public transport to get around. The cities might not be big, but most of them have well-preserved old towns, which should be on your list when exploring cities like Zurich, Bern and Lucerne. Switzerland is quite an expensive country, but the “Bahnhofstrasse” in Zurich is the most expensive shopping street in the world. Don’t forget to stroll through the surrounding towns and quaint little villages, as they all add their own unique beauty to the experience of Switzerland as a whole. Unlike most places you travel to these days, Swiss tap water is safe (and delicious) to drink. There are also many water fountains offering fresh water, so it is highly advisable to have an empty bottle on hand. Switzerland has some of the highest and most spectacular waterfalls in Europe. From the Rhine Falls to Giessbach, Staubbach to Trümmelbach Falls and many others you will pass whilst taking a road trip across this beautiful country, chasing waterfalls is a must. Though Switzerland is often considered a winter fairytale, castles in Switzerland seem to take a back seat to the mountains and lakes and the incredible scenery. Some of the most famous castles are Chateau du Chillon in Montreux (on Lake Geneva), Schadau Castle, and Castel Grande in Bellinzona and should be an itinerary must-see. Even though Switzerland is located in Europe, it is not part of the European Union. The currency they trade in is Swiss Francs, although some vendors accept Euros. Depending on your nationality, you may need a Schengen visa to travel to Switzerland. Short-term visa applications (up to 90 days) such as tourist, visit or business can be submitted online. Visa applications can be submitted 3 month before entering the Schengen area at the earliest. So, what about the chocolate? Unfortunately, the chocolate experience in Switzerland is something impossible to describe; it has to be experienced first-hand. If you simply have to know, ask the Easter Bunny – he knows all the secrets.